WGC-Accenture Match Play world golf championship tournament. 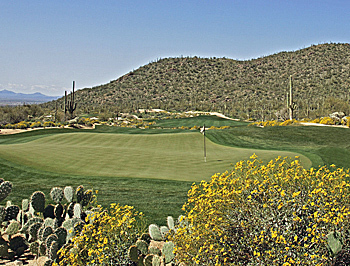 The 2014 WGC-Accenture World Match Play golf championship is in it's new location and venue in Tucson Arizona. In 1996, golf's five leading professional Tours -- the European Tour, Japan Golf Tour, PGA TOUR, PGA Tour of Australasian and Southern Africa Tour -- reached agreement on several key elements of professional golf designed to create new international events beginning in 1999. The World Golf Championship events feature players from around the world competing against one another in varied formats (match play, stroke and team). A common qualification standard for the series is top players from the Official World Golf Ranking, which ensures a strong field. The World Golf Championships feature some of the largest purses in professional golf. First prize money is in excess of $1 million. Eligibility for the WGC-Accenture Match Play Championship is limited to the top 64 available players from the Official World Golf Ranking. The format for the event is single-elimination match play. Players are seeded 1 through 64 based on their Official World Golf Ranking with the No. 1 seed playing the No. 64 seed, the No. 2 seed playing the No. 63 seed, etc. (Player seeding combined adds up to 65). Past champions include Jeff Maggert, Darren Clarke, Steve Stricker, Kevin Sutherland, 2007 winner Henrik Stenson, 2008 winner Tiger Woods, 2009 winner Geoff Ogilvy, Ian Poulter in 2010, with Luke Donald winning here in 2011, Hunter Mahan in 2012, and Matt Kuchar defending here after winning the event last year in 2013. -Stay Tuned For CaddyBytes exclusive pictures, stories, interviews, the week of the WGC-Accenture Match Play Championship! New in 2014: Golf and Travel is the place to go on CaddyBytes for golf courses travel to info places to stay and play! Travalite Ultima II golf travel bag! - Holds a full set of 14 clubs including four woods It's lightweight yet rugged - 5.6 lbs. w/out cover. Molded of high density HDPE. Is 7 and 1/2" diameter Graphite friendly design accomodates any 47 1/2" drivers Thick padded shoulder strap stores inside during travel -plus an airport carry strap Fully removable accessory pouch with two large pockets Divider to separate drivers from irons Locking lid, with keys. Two inch wheels for ease of movement during travel!